I am currently at SXSW, my forth trip to the event. As conferences go, I find SXSW pretty enjoyable and always come back with a couple of new ideas that I can play with. 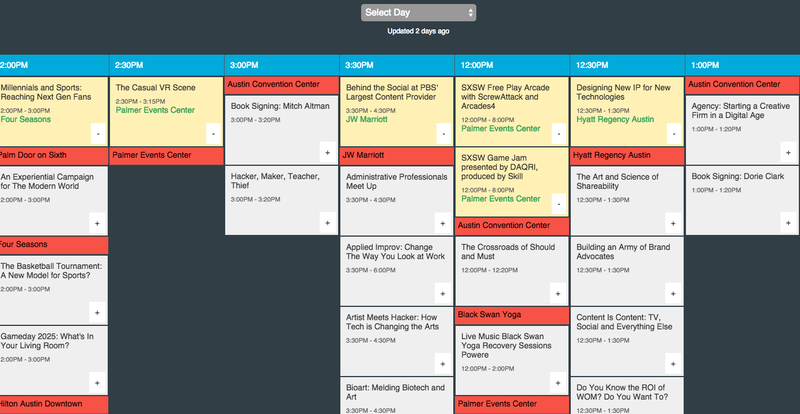 However, as much as I like the event, trying to manage your schedule on the SXSW app itself is pretty annoying. At the top of the app as it exists currently, all days are listed in a horizontally scrollable tabs. 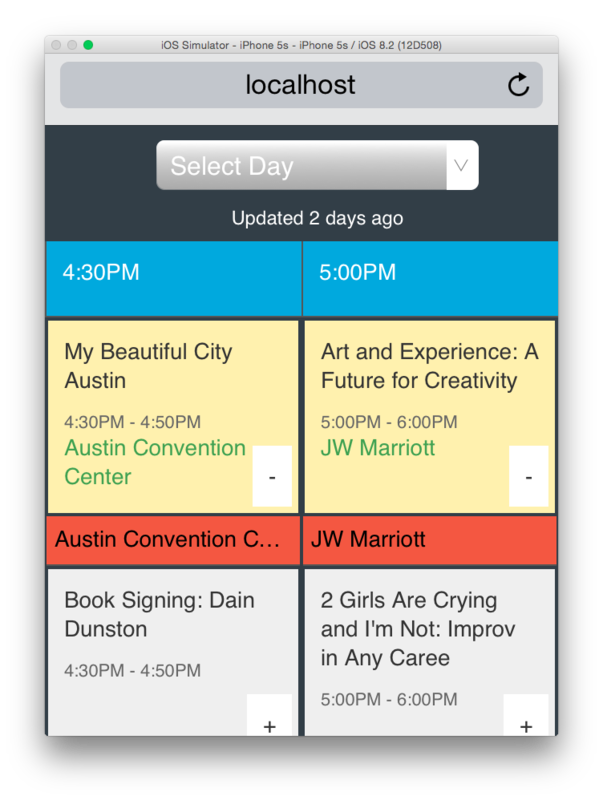 Clicking on a particular day lists the events for that day in a vertical list, which is typical for apps of this kind of application (though the SXSW app does make it additionally worse by not even adding sectional headers marking the division between different time slots). You can star individual sessions and view them in a separate “My Events” section of the app. Its hard to quickly glance how your schedule is across time slots. Even the My Events section of the app doesn’t group your events by time. Because the switching the day of the event is not so important, the app lets you do that using a drop down chooser thats placed on the header of the app. This leaves the horizontal axis to break the day out in terms of time slots. 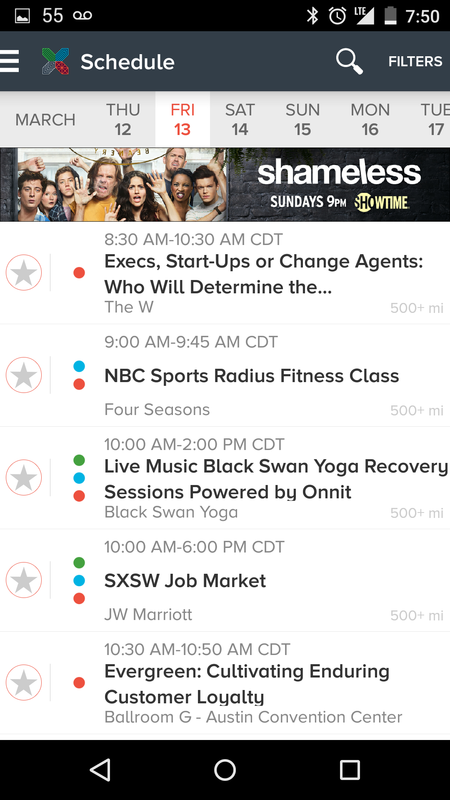 Within each time slot, the events are grouped by location. Adding an event as a favorite moves it to the top and changes the background color so that you can quickly scan events you have marked as interesting really quickly. At this moment, these events are saved locally on the browser’s localStorage space and do not sync across devices. The app was a quick experiment and of course needs a lot more improvement like global filters by event type and location, cross device save, etc. There are also some HTML glitches that I need to fix, like the whole page scrolling slightly within the viewport in the mobile experience. The code is all on Github if you’d like to add those features or fix bugs.